Sherwood Forest is beleaguered by rivaling bands. Everybody wants to be the best, the leader who unifies all bands. But only the most glorious will prevail, the one who gathers the most riches to give to the poor. Plan your raids by gathering information, recruiting new companions and couching in your hide-outs. Form alliances to attack heavily guarded gold transports and avoid the sheriff! 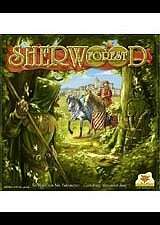 Clever bargaining and well-planned raids will make you the heir of Robin Hood and the new leader in Sherwood Forest. Sherwood Forest is full of surprises. First and foremost, it is a turbulent and exciting negotiation game. Clever agreements and choosing the right partner in changing alliances will lead to victory.